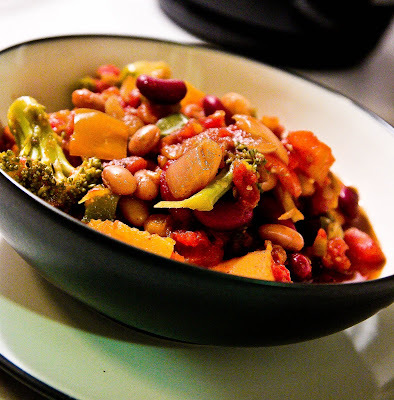 This is recipe adapted from Fat Free Vegan (if you decide to stick around and see what else is cookin' you might notice a trend), but with some minor changes. Both Yousuf and I find it really hard to follow directions (why else would I, a decent brown girl from a good family, end up marrying some white dude with dreadlocks? Oh wait. That's a story for another post.) - so we're always fiddling with recipes to make them better. For us. Most normal people will probably find that following recipes results in a totally amazing culinary experience...but why be normal, when you can be like US? Above: Sunday Night Football Never Looked So Good. Heat a large, non-stick pot over medium-high heat, and add the onion and bell pepper. Sauté until the onion is translucent and the pepper is soft, about 7-9 minutes. (You may add a little water to prevent sticking.) Add the garlic and sauté for 2 more minutes. Add the beans, and adjust the seasonings, if necessary. Cover and cook until the squash is tender but not falling apart (about 40 minutes). Serve in bowls, garnished with oregano, if desired. Then negate all the health benefits of this chili by serving with a huge hunk of garlic bread, thereby infuriating Broccoli Boy. But believe me, it's all worth it. It always is.